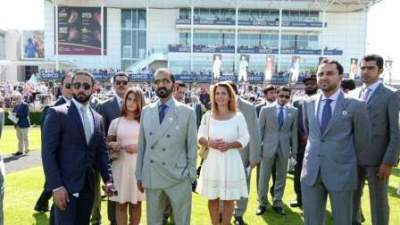 His Highness Sheikh Mohammed bin Rashid Al Maktoum, Vice-President and Prime Minister of the UAE and Ruler of Dubai, watched on Sunday the 1000 Guineas Stakes at Newmarket's Rowley Mile course. On Saturday, His Highness attended the 2000 Guineas Stakes, the first Classic race of the British racing season, where UAE riders stole the show with a number of titles. The race was also attended by Sheikh Hamdan bin Rashid Al Maktoum, Deputy Ruler of Dubai and UAE Minister of Finance, Princess Haya bint Al Hussein, wife of His Highness Sheikh Mohammed bin Rashid Al Maktoum, Vice-President and Prime Minister of the UAE and Ruler of Dubai, along with a number of Sheikhs and officials. Wuheida, owned by Godolphin, won the 1800 metre Dahlia Stakes race (Group 2). Sheikha Al Jalila bint Mohammed bin Rashid Al Maktoum received the trophy amidst applauds of fans.